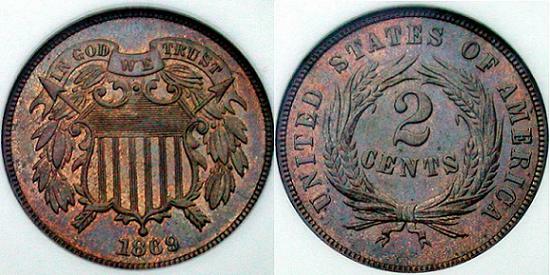 The United States two cent coin was produced from 1864 to 1873. It was made of 95% copper and 5% tin and zinc and is a little bit smaller than the quarter we know today. No one knows for sure why a two cent piece was introduced, but it is possible that it was an effort to return some coins to circulation. Around the time the two cent piece was introduced, the Civil War was in its third year and people began to worry about what was going to happen. It had been believed that it would be a very short war. Worried about the economic future of the United States, they started stashing away coins for the hard times they feared were coming. First they began hoarding gold and silver coins, but eventually all coins disappeared from circulation. So, when the two cent piece was first released to the public, it appeared that it would be accepted. People were using it regularly for their day to day purchases. Later, however, it was determined that the only reason people accepted the coin was because of the shortage of circulating coins caused by the Civil War. When the war ended and people began using their silver coins once again, the two cent piece fell out of favor. So, the two cent coin became one of the shortest lived issues of United States Coinage. Interesting Note: The two cent piece was the first US coin to include the motto "In God We Trust". It was produced during the Civil War and, as is so often seen in adverse times, people became highly spiritual and turned (or returned) to God for their hope and salvation. A letter written by Baptist minister Mark R. Watkinson to Treasury Secretary Chase urged for "the recognition of the Almighty God in some form on our coins." Watkinson continued: "This would relieve us from the ignominy of heathenism. This would place us openly under the Divine protection we have personally claimed." Secretary Chase clearly agreed and the inscription was included on the two cent coin. This new motto was such a hit with the public that many people lobbied congress to include it on all future coins, which resulted in a new law requiring the motto on all coins where it would fit. Later, in the mid twentieth century, congress passed a law requiring the motto on all US coins. During the 1970s, some discussion took place as to whether the production of the one cent coin (penny) should be slowed and the two cent piece brought back into circulation, but it was never acted upon.